At first glance the mitigation process may seem rather daunting. Well, fear not. 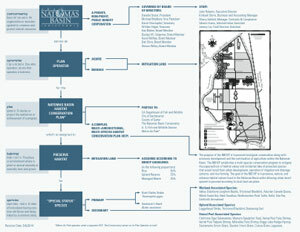 This webpage will provide you with plenty of information for a better understanding of the process. 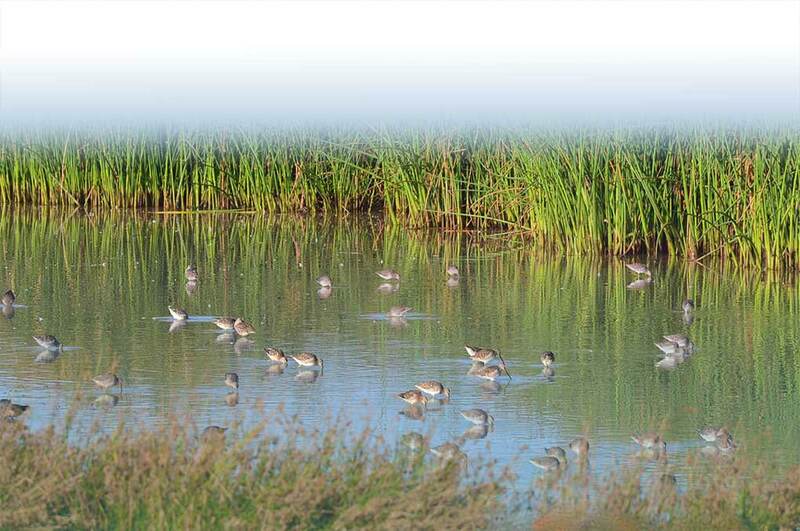 Implementation of the Natomas Basin Habitat Conservation Plan (NBHCP) provides mitigation for urban development in the Natomas Basin by establishing a reserve system composed of managed marshes, upland habitats, and rice lands. Acceptable mitigation requires maintenance of a 0.5-to-1 mitigation ratio. That is, for each one acre of habitat disturbed, one-half acre of mitigation land must be provided for. All NBHCP mitigation land will ultimately consist of 25 percent managed marsh, 25 percent upland and 50 percent rice. By clicking on and opening the NBHCP Flow Chart at right, viewers can get a simple illustration of how the NBHCP works and what the Conservancy’s role is. By reviewing this illustration, readers will be better prepared to review and understand the project mitigation process described further below. Under the NBHCP, mitigation fees provide for land acquisition, enhancement, and management and monitoring activities. Fees are paid on the basis of a one-time, up-front fee levied upon an authorized development site that is subject to mitigation based upon a 0.5-to-1 mitigation ratio. The Conservancy offers two forms of mitigation fee payment, 1) full fee, and 2) fee with land dedication. The Conservancy, as directed by the NBHCP, ensures that certain conditions are met before accepting land when the land dedication option is used. 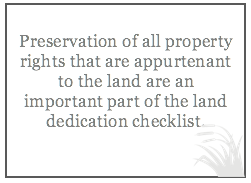 The Conservancy’s Land Dedication Checklist and the NBHCP provide guidance on land acquisition criteria. The federal and state wildlife agencies must approve all land acquisitions, including land conveyed to the Conservancy using the land dedication process. Acting as the NBHCP’s “Plan Operator,” the Conservancy has developed a Finance Model that analyzes the projected revenues and expenditures of implementing the NBHCP. The NBHCP Finance Model is dependent on actual costs incurred to date, a forecast of development of the Natomas Basin, and the corresponding habitat mitigation required. Based on these assumptions, the Finance Model calculates the mitigation fee required of new development. Land Acquisition (LA) Fee Component. This fund provides for the acquisition of mitigation lands by the Conservancy. The costs associated with land acquisition are the costs to acquire the land and transaction costs including legal costs, generally speaking. The fund also provides for a contingency in case land costs spike in any given year prior to updating the fee. Once all land is acquired in order to meet mitigation requirements, this fund will no longer be necessary. 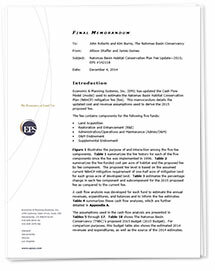 Restoration and Enhancement (R&E) Fee Component. This fund provides for restoring and enhancing mitigation lands acquired by the Conservancy. For example, the creation of managed marsh would be provided for by the revenues generated in the Restoration and Enhancement Fund. Once all land is acquired and subsequent restoration and enhancement occurs, this fund will no longer be necessary. Administration and Operations & Maintenance (O&M) Fee Component. This fund provides for the on-going operations and maintenance of the mitigation lands, including the costs to administer the funds collected from the mitigation fees, insurance, property taxes, water, property management, biological monitoring, etc. This fund is projected to exist in perpetuity. After year 50, the Admin/O&M Fund revenues are supplemented by interest earnings from the O&M Endowment Fund. O&M Endowment Fund Fee Component. This fund is structured as an endowment, such that fee revenue is accumulated as principal that will earn interest income over time. The interest income is utilized to subsidize funding for the Admin/O&M Fund after year 50. Supplemental Endowment Fund Fee Component. This fund was established in the 2003 NBHCP to accumulate revenue to allow the Conservancy to purchase up to 200 acres of land in advance of all fees being paid or to supplement annual purchases in the case that land prices spike dramatically in any given year. It is also available to use for any unexpected emergencies. Once all land is acquired in order to meet mitigation requirements, this fund will no longer be necessary. The Finance Model is intended to be a dynamic, fluid analysis of each of these funds and allows for interaction between the funds (excluding O&M Endowment Fund principal). The section within the NBHCP that discusses the mitigation fee may be viewed here. * Please note: the NBHCP Finance Model helps inform the Conservancy’s annual HCP recommendations to public bodies, as is required by the NBHCP. The annual establishment of the HCP fee itself is determined by the City of Sacramento and/or County of Sutter through ordinance, and the NBHCP Finance Model’s suggested fee is guidance only. Both are required only to “ensure adequate funding” and may conclude some other amount other than that indicated by the NBHCP Finance Model is adequate and appropriate. 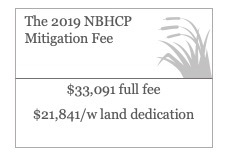 As the Metro Air Park Habitat Conservation Plan (MAPHCP) is linked to the NBHCP with regards to the Mitigation Fee, all Mitigation Fee updates to the NBHCP apply to the MAPHCP as well. Non-HCP and Special Projects: On supplemental mitigation projects where mitigation ratios are not one-half to one (0.5 to 1, or 0.5:1), mitigation payments must be converted to equal the one-half to one established fee. It is very important to consult with Conservancy staff or experts when contemplating a non-NBHCP mitigation project when there is a different mitigation ratio.